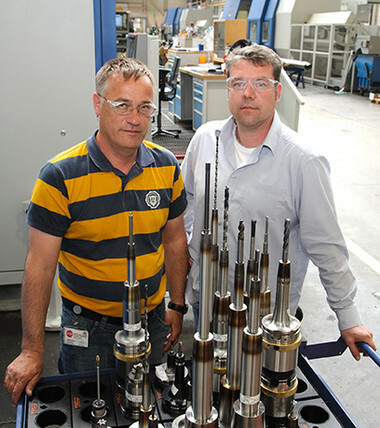 For the oilfield evaluation service company Baker Hughes INTEQ, the shrink fit technology from Haimer solved a production problem: this technology enabled the configuration of extremely long tools, partially with some extensions that enable drills at very sharp angles and extremely high runout accuracies. The short cycle time, which the three Power Clamp NG shrink fit machines require for a shrinking process, provides an important advantage for the company in Celle, as there are up to 80 shrinking processes a day. Measured against the dimensions of the entire drilling rod, Baker Hughes INTEQ GmbH, Celle, pro-vides only a small component – but this has an essential importance for the success of bores for petroleum or natural gas: In the up to ten kilometer long drilling rod, the approx. 4 to 6 meter long Baker Hughes INTEQ systems are placed directly behind the drill bit. Although they only serve for measuring the local environmental conditions and for steering the drilling heads, the elements with diameters of 130 to 250 mm have to absorb and transfer the entire drilling forces. Additionally, they have to bear hydrostatic pressures up to 2,500 bar, temperatures up to 150 degrees Celsius and vibrations up to 50 times of Earths gravitational acceleration – all that in a very chemically aggressive environment. In the production of their components, the CNC experts of Baker Hughes use tool holders and extensions with the shrink fit technology from Haimer. In 2001, when they bought their first shrink fit machine from the company in Igenhausen, there was no alternative in the market. “Back then, only Haimer could realize our requirements for extremely long tools” remembers Eike Schaper, team leader in CNC programming. In the course of time, machining became more sophisticated. Especially bores at extreme sharp angles below the building component were required. To avoid a collision of the spindle with the work piece, extremely long tools – often also with tool holder extensions – are inevitable. The lengths of the tools partly reach more than 1,400 mm. The high performance shrink fit machine Power Clamp Profi Plus, which Baker Hughes bought in 2001, offers a tower with a coil for inductive heating that has a relatively large height range. But to be able to shrink extremely long tools in and out, the tower uses an additional hinge that rotates 180 degrees. When this is used, the induction coil is not located above the base of the shrink machine anymore but above the floor of the factory. Then the tool holder is placed on a platform that is mounted laterally to the table on which the shrink fit machine is placed. The design of the machines enables a secure configuration of extremely long, shrink-fitted tools” explains Andreas Landmann, CNC programmer at Baker Hughes, who among others is responsible for the shrink fit technology. Additionally, the combination of high clamping force and high runout accuracy meets the tight tolerance requirements and decreases the wear on the drilling and milling tools. For example, on a tool holder with a diameter of 20 mm, Haimer guarantees a clamping torque of 450 to 800 Nm. No other tool clamping system can achieve such high runout accuracy. It results from the rotationally symmetric clamping body which requires no further elements like collets or clamping screws. The chuck is heated and the clamping bore expands, allowing the cutting tool to be inserted. During the cooling process, the tool holder contracts around the shank of the cutting tool. Haimer tool holders boast a runout accuracy of less than 3 µm (calculated at a protruding length of 3x shank diameter). “The competing clamping systems, that the Haimer shrink fit technology was able to prevail against, had either lower clamping forces, the maximum achievable length was not enough or they were built too large so that the required drills at sharp angles would not have been possible“ explains Eike Schaper. The reason why Baker Hughes trusts Haimer since 2001 is essentially based on the high performance New Generation (NG) coil technology, which provides high speed shrinking in and out, while using an extremely precise energy input. This is based on an adjustable coil that adapts to the length and diameter of the chuck. Thus, only the clamping area is heated, which, among other advantages, considerably shortens shrinking and cooling time. The NG induction coil ensures that the heat infiltrates the tool holder very quickly. This is especially important for a shrinking out process in case the cutting tool and tool holder consist of materials with the same thermal expansion coefficients. Thus, the chuck expands while the cutting tool is kept relatively cool, enabling the cutting tool to be removed. If heated slower, both of them would expand in a similar way – and the tool couldn’t be extracted. Haimer also earned credit for the flexibility of the NG induction coil. “Back then, we asked all manufacturers: how does your system handle broken tools?” reports Andreas Landmann. The Haimer solution convinced him. As the induction coil is connected to the shrinking machine with only a cable, one can also position the coil without any problems over a tool holder that is horizontally fixed in a vise. While it is heated there, an employee can extract the broken tool from the underside of the tool holder. Of course, Haimer also has an adequate standard unshrinking device. Thus, even in the case of tool breakage, the tool can be replaced without any delay. A rapid cooling after the shrinking procedure is important for Baker Hughes. Haimer ensures this by using contact cooling. Precisely fitting cooling bodies for various external diameters ensure that the largest possible contact area is used and the contact cooling removes the heat through a closed-circuit circulation. Consequently, the tool holder can, depending on its diameter, be removed and inserted again within 30 to 45 seconds. “For systems with air cooling, cooling down can take up to 10 or 15 minutes” emphasizes Landmann. With 60 to 80 shrinking processes a day, this can be a major cost factor. And if a tool assembly consists of a tool holder and two extensions – which happens quite often at Baker Hughes – three heating and cooling processes are required. Thus, the time advantage increases threefold. The required high amount of tool changes is caused by the high-temperature resistant chromium-nickel steel that the underground measuring systems are made from. Only such steels that are also used for aero-space engines or gas turbines can bear the high strains at the top of the drill string. This causes correspondingly intense strain on the tools while machining: After 12 to 14 threads, the solid carbide forming taps wore out. Additionally, 145 drilling and milling tools are in use during the 120 hours of producing a measuring instrument 4 meters in length. After Baker Hughes success on drilling applications with shrink fit, they decided to also use shrink fit technology for their milling applications. By now, almost half of their cutting tools are used in shrink fit chucks. In 2005 and 2012, Baker Hughes bought a second and third shrink fit machine from Haimer. The most powerful one with an output of 20 kW is in use in the tool crib. There, all tools are mounted and preset according to the standards of the digital tool management system. Then an entire toolkit for a specific CNC machine is delivered. Andreas Landmann explains: “The operator’s focus should be on the optimal machining of the work piece. The tool assembly should not distract him. Hence, it has to be optimally configured and set up.” The Power Clamp Preset NG from HAIMER, with a 13 kW output, is placed freely accessible in the hall with the CNC machines. This is because the operators of the machines have to be able to replace worn or broken tools around the clock, even if the tool shop is not attended. Additionally, Baker Hughes protects itself against the case that the machine in the tool shop might fail. They placed a further Power Clamp Preset NG, also with an output of 13 kW, at one of its external suppliers. Eike Scharper sums up: “With these shrink fit machines, Haimer offers a system that is easy to use. Hence the operator in the late or night shift can replace the tool in case of breakage. The system is very reliable and the components are rapidly available as Haimer is the only manufacturer that offers both, machine and tool holders, as an assembly from one source. Baker Hughes INTEQ, Celle, is one of the world market leaders in the area of underground measuring instruments for highly challenging drilling situations, e.g. in the deep-sea. In Celle, Lower Saxony, around 700 employees work in the production and 800 in research and development. The company’s systems are placed right behind the drilling head and deliver information about the locally specific conditions, while also steering the drilling head at the same time. Based on the data from the deep-sea, their experts then lend their knowledge acquired from their measuring instruments to oil companies and provide them recommendations regarding the optimal drilling speeds and adjustments in their drilling applications. Baker Hughes INTEQ is a subsidiary of the US oilfield evaluation service company Baker Hughes Inc. Houston, which employs more than 58,000 employees in more than 80 countries and generated a turnover in 2012 of around 21.4 billion USD.